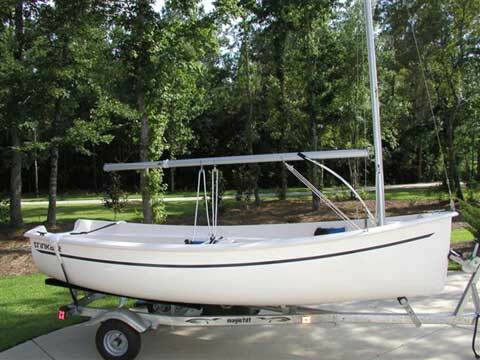 Sailing Adventures of David & Kathy: Ultimate sailing dinghy for LightSpeed? Ultimate sailing dinghy for LightSpeed? We've been thinking about a replacement for our AB 10AL rigid bottom inflatable. It's served us well for 5 years and it's probably the ultimate powered yacht tender for it's incredible stability, dry smooth ride and light weight. However, a sailing dinghy would be more fun and rowing would be good exercise. LightSpeed's davits can accommodate an overall length of 13'-10" and this opens the door to plenty of options. Free-board to ensure a dry ride. Single sail for easy operation. Kick up rudder and durable hull for beach landings. Rigged weight of ~200 pounds. Crew weight of ~ 300 pounds. 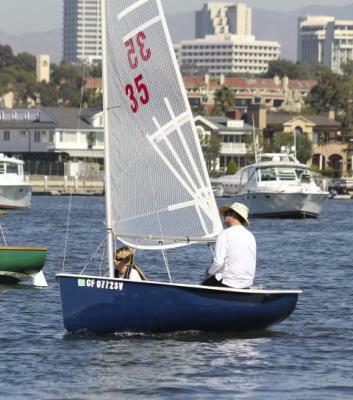 Designer Bruce Kirby (of Laser and America's Cup fame) has designed a hull with traditional and classic looks that will plane readily, is comfortable to sail, surprisingly seaworthy, and easy to right in case of capsize. The self-draining cockpit quickly eliminates water and makes it possible to leave the Trinka 12 safely unattended at a mooring. The Lehman 12 is an exceptionally responsive two-man planing dinghy that quietly glides through the water with only a whisper of wind. It is a daggerboard boat with a loose-fitted cat rig and a deep rudder. The simple, uncomplicated design of the Lehman 12 makes it great for the husband-and-wife team. Following the successful updates made to the Naples Sabot, Lido 14, and Santana 20, the W. D. Schock Corporation redeveloped the Lehman 12 in 1998, maximizing the fun of sailing and minimizing upkeep. Working with Lehman 12 class officers, Schock developed a stiff, light, virtually maintenance-free boat that conforms to all existing class rules. The rails, mast partner, center thwart, and fore and aft flotation tanks are molded fiberglass parts. Gone are the mahogany and oak rails that required frequent varnishing, weighed a considerable amount, and would loosen with use. In their place, the "new"Lehman 12 has comfortable flared hiking rails that give the boat a contemporary look and feel. Class-sanctioned strengthening stringers have also been added, and an aluminum tiller replaces the wooden tiller.